In 1954, Lloyd Franks decided to give back to the community he had grown up in. He had several very profitable businesses in town, but wanted to show his appreciation to the community for all the success he had enjoyed. Just outside of town, Lloyd owned a small parcel of land, and he and his sons got to work. 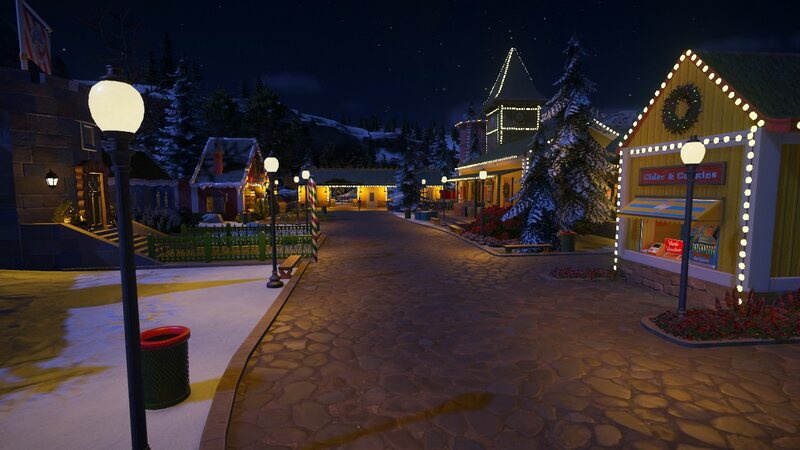 They cleared some of the land and built a few small buildings for the upcoming holiday season. 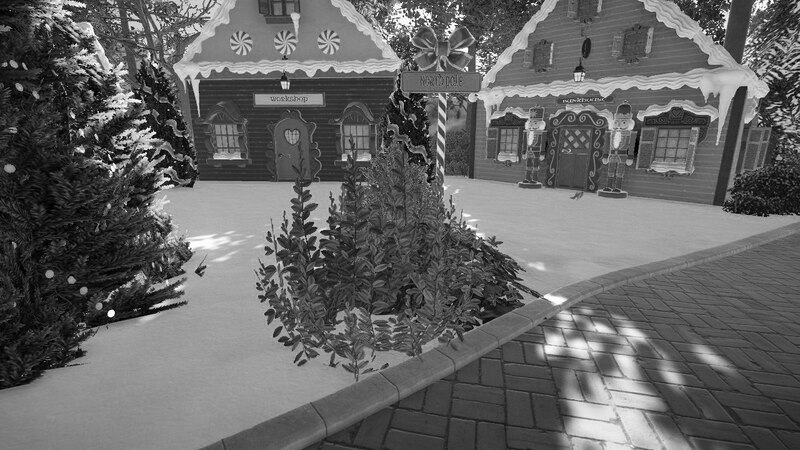 They built Santa's Workshop and a small Elf Bunkhouse. 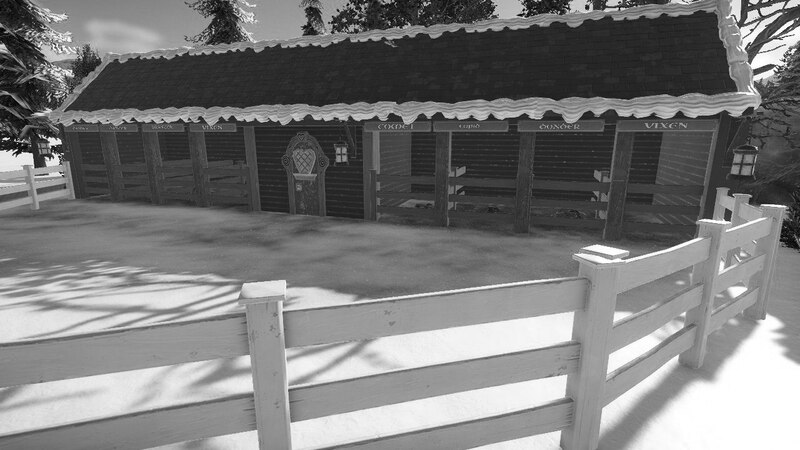 In cooperation with the local zoo, Lloyd also set up a small paddock for some caribou that would have to double for reindeer. They gave away hot cider and cookies, and kids could come visit with Santa on weekends. 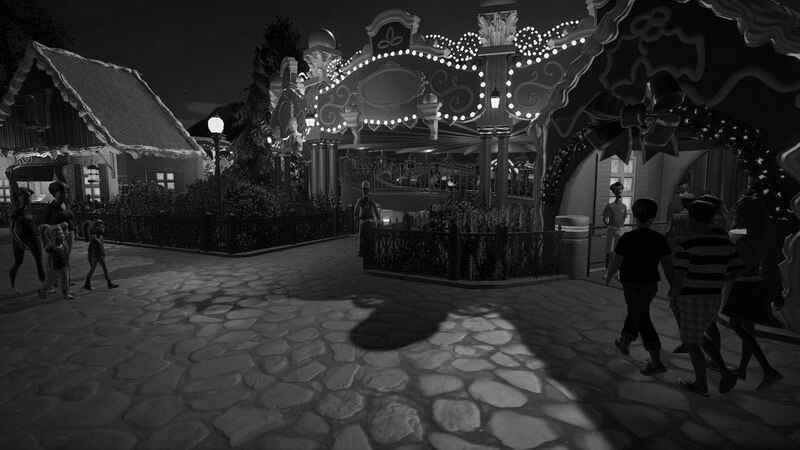 The small area was a tremendous success for the town, and Lloyd thought that perhaps he could do more. The next summer, he contracted with the Fisherman Amusement Company out of Texas, and purchased an old 1926 Waltzer ride. 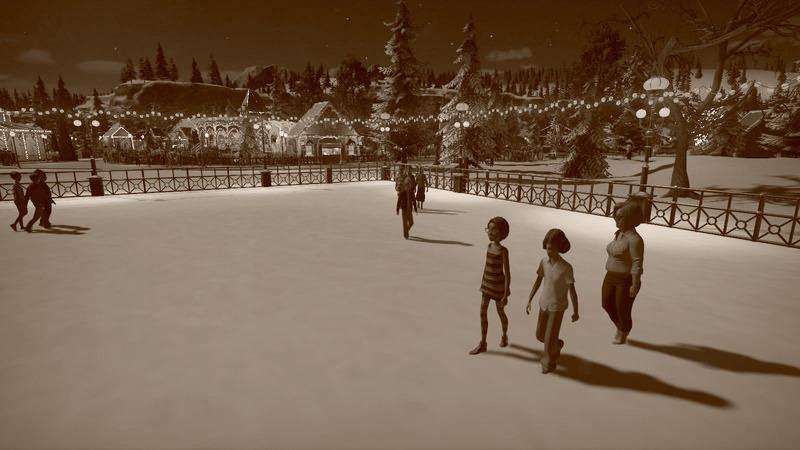 After a few modifications and a coat of paint, the Waltzer was ready to go that 1955 holiday season. Lloyd insisted that the community not be charged for the rides, and crowds grew and grew each weekend! Charming! 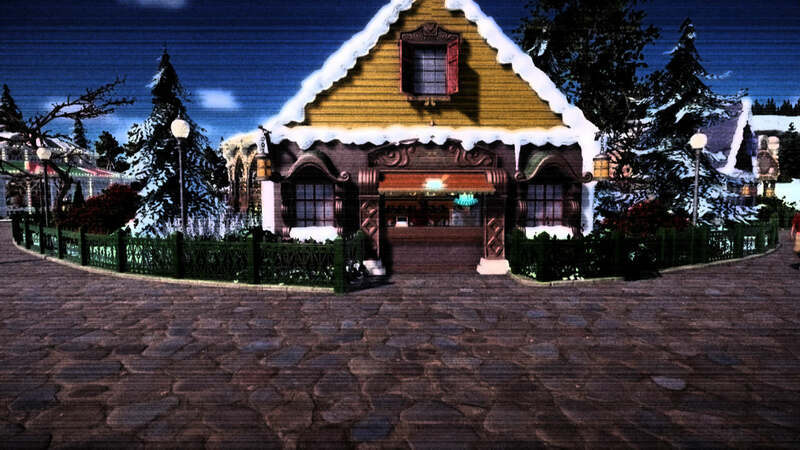 The North Pole houses totally have that "plywood" look to them. And love what you did with the Waltzer. A word of caution: If Fisherman Amusements tries to sell you anything with the word "hippo", say no. I love the cover for your flat ride.. The details are amazing! Thank you, but the flat ride skin was created by Fisherman. I merely tweaked it a bit. He did a marvelous job! 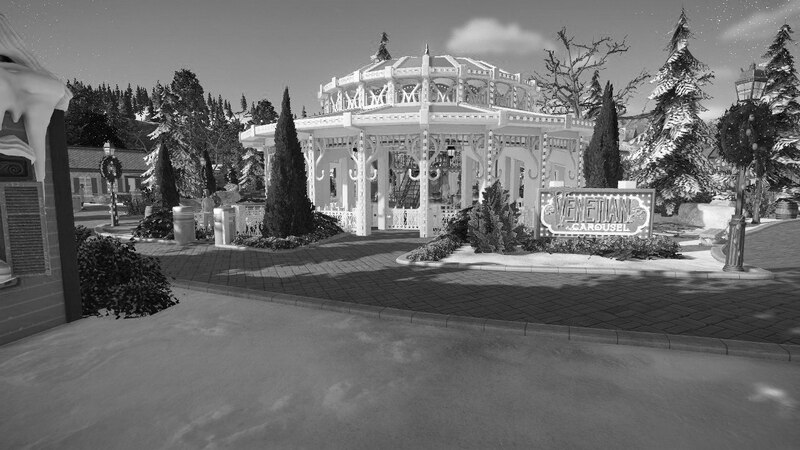 By 1957, another ride was added to the nascent park. A Venetian Carousel and building were saved from demolition on an old New Jersey pier, and Lloyd and his sons, as well as a great bunch of friends and volunteers reassembled, spruced up, and made operational the beautiful carousel. On the underside of one of he pavilions beams, they found an old brass plaque that stated the unit had been constructed by the Matt-Caf Corporation. Only some minor restoration work on the gazebo itself was necessary to bring the wonderful building back to life. 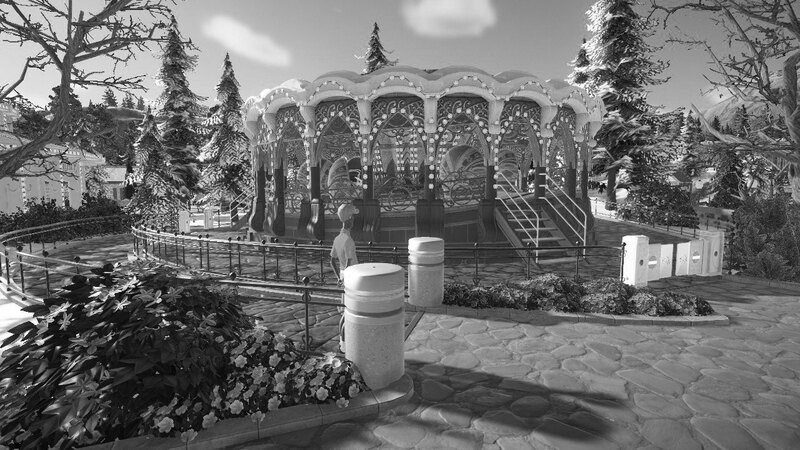 Another vintage park by citytrader. Everything looks great so far. Too bad these old photos are in B&W. I'm sure they don't do this park justice. Maybe we'll get some color photos as time progresses. Color photography was pretty expensive back in 1958! Lloyd loved the way his little community project was shaping up, but felt there was still more he could do. Kids loved visiting Santa in his workshop, however Lloyd thought something a little more grand might be in order. Back to his lumber supply company he went with a plan in mind. 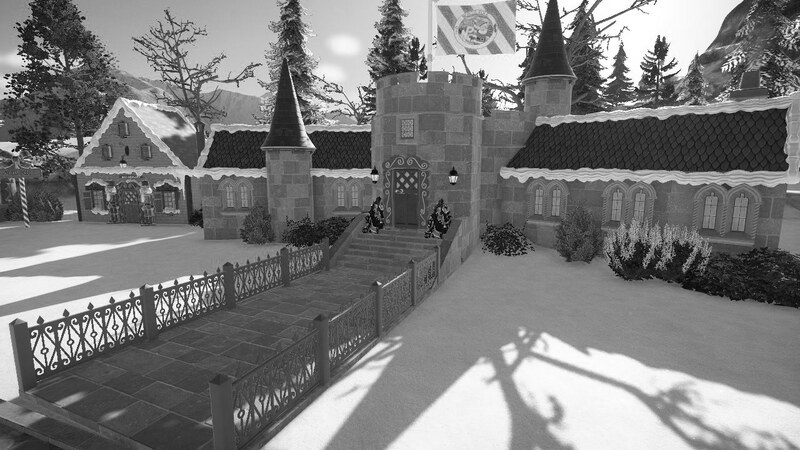 When kids came to the park he had decided to name "Santaville" in 1959, they would be able to visit with Santa and get their cider and cookies from the always beautiful Mrs. Claus in their brand new castle! The building had a central rotunda where kids could warm up a bit, then head right to see Santa, or into the left wing for treats with Mrs. Claus. Looks delightful, Rich! I LOVE the stables! Too cute. 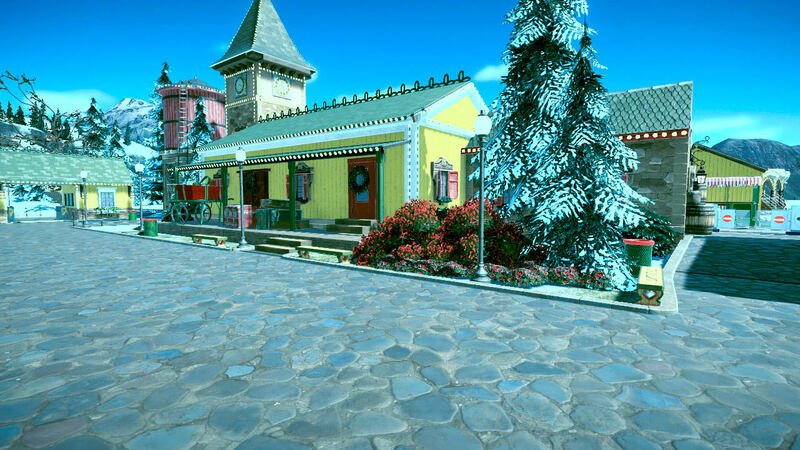 Santaville saw it's next expansion in 1961, when Lloyd found an old narrow gauge engine and a few cars available for sale from a defunct park in Pennsylvania. 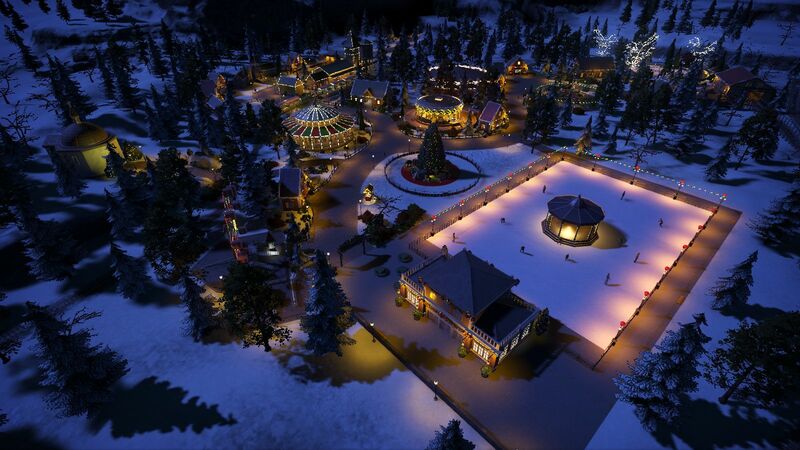 He sent off a few trucks and brought the equipment to Santaville. It took a couple of years to grade the roadbed, install the track, and refurbish the cars, but she ran like a champ. 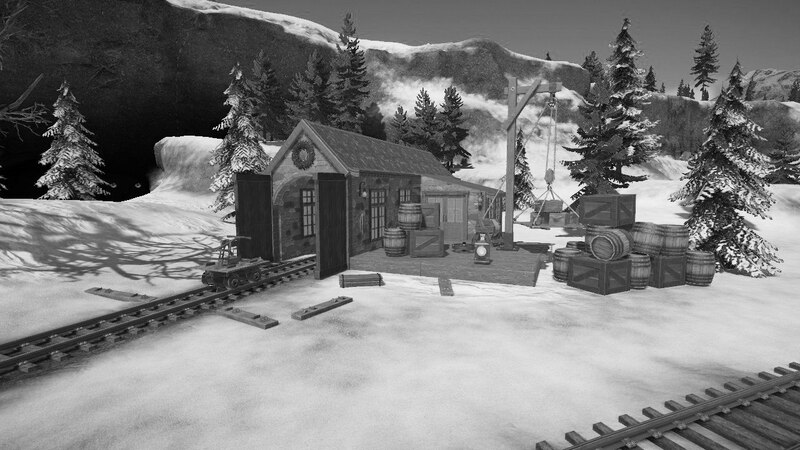 The next big task was to replace the simple ramp for loading into a real honest to goodness train station. He actually hired a local masonry company to build the giant clock tower, and to replace the foundations on a couple of the older buildings. 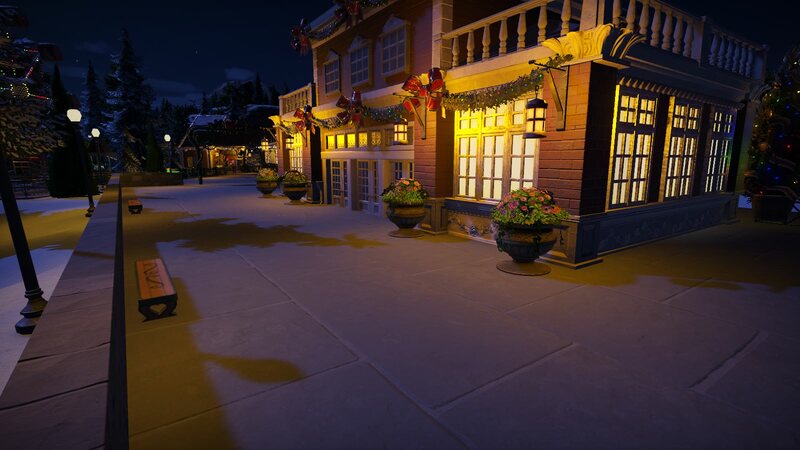 He also installed string lights around many of the buildings in the park. This should have been posted Monday, but just got back into town! 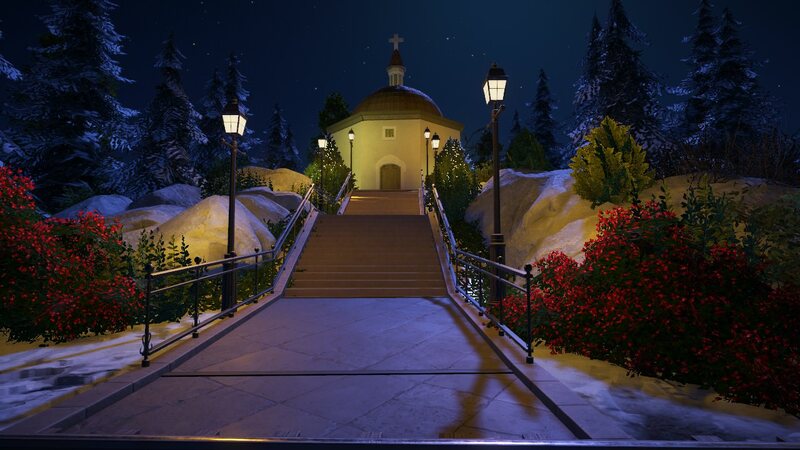 Lloyd wanted people to remember the reason for the season, so he had built on a small hill on the edge of the grounds a recreation of the Silent Night Chapel in Salzburg, Austria, for people to visit, and even for occasional services. The most popular service is of course midnight on Christmas eve. Thank you so much, however, the ride skin was created by by someone on the workshop named Matt-Caf. This photo (badly weathered and faded) shows one of the many shops around the park. To save time and money, the buildings are all built with the same basic plans, and slightly modified for each unit. Lloyd is still footing the bill for all the park's expenses, but saving a dollar is saving a dollar! Rumor has it that Mr. Franks is looking into two major attractions for the upcoming 1963 season! Just a real pretty picture! This beautiful ride enclosure was created by Rhian. Lovely! Glad to see you working on this again. This must be a lot of fun to work on. I love it. Gotta try some small scaled projects myself sometimes. Thank you guys! It is nice to be back. I do seem to have less and less free time, but I try! Thanks CoasterCad! That does look nicer! Just a night test of all the lights prior to the grand opening! Glad to this this project back. That last screenshot looks beautiful. Love the lighting. I'm SO glad to see this back. It's just what we need on the run up to Christmas. 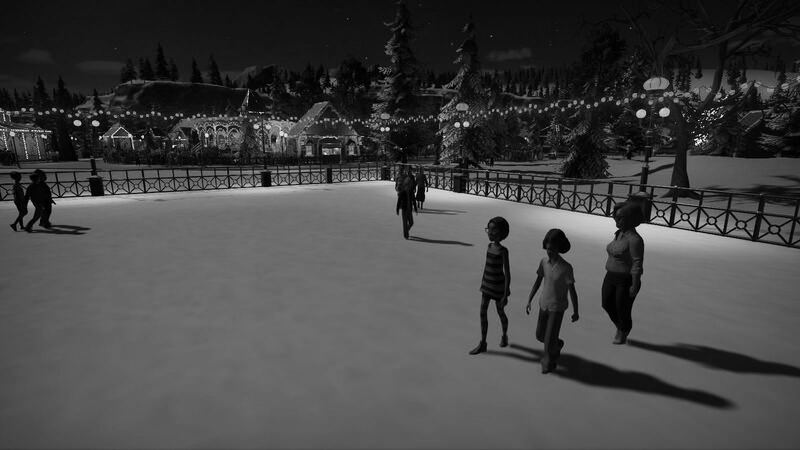 One of the major draws to the plot of land for Lloyd Franks was the old Victorian skating Pavilion that was on the site. Again, with lots of community support, he was able to restore the building as well as the rink. The community now has a wonderful rink to use throughout the season! 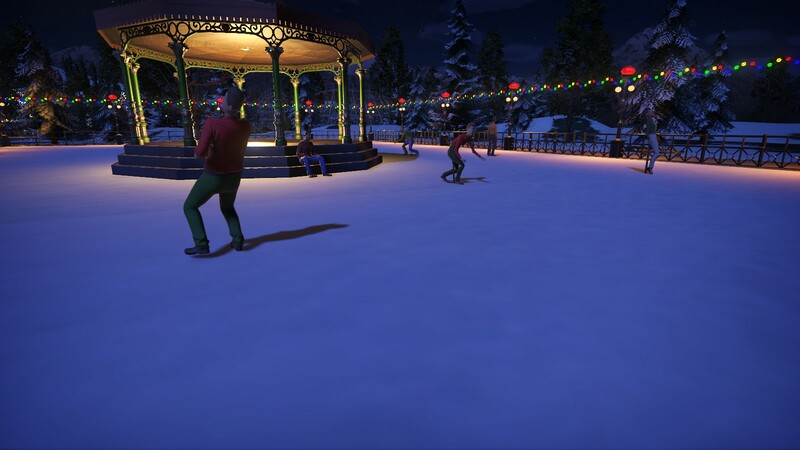 The ice rink looks fantastic, especially with the perimeter lights. So much better than my frozen pond. Beautiful pictures. I especially like the overview. 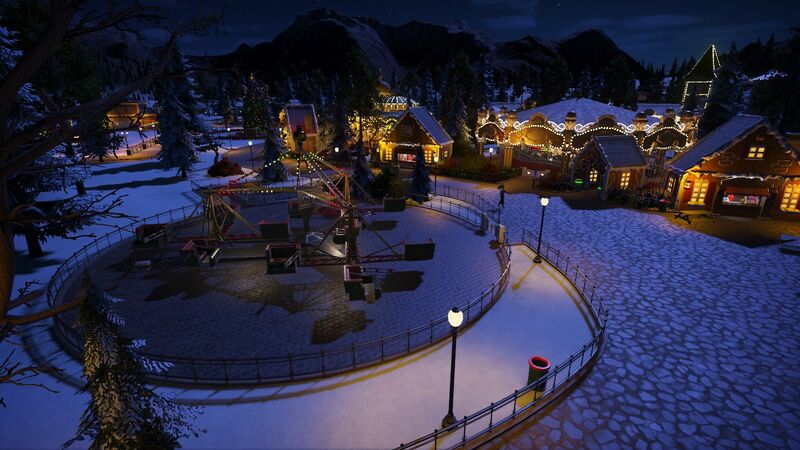 The amount of christmas decoration and lighting is perfect. 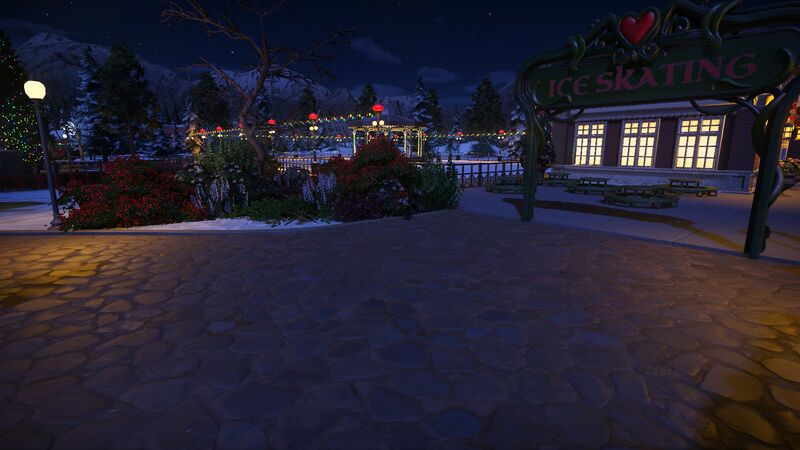 I can imagine it would be easy to go over the top with christmas decorations and lights, but it seems flawless in this park. great job!